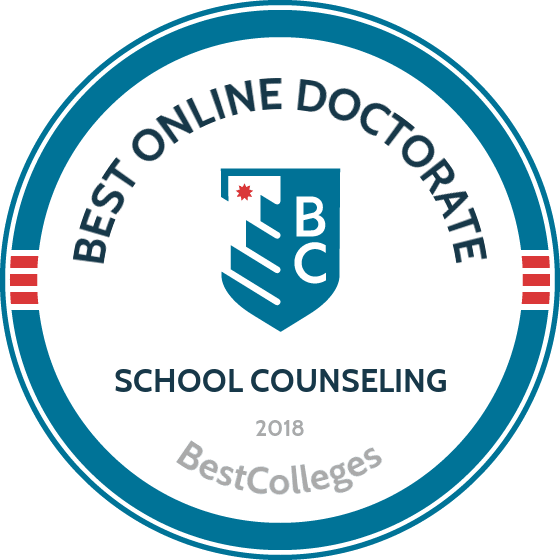 WHAT ARE THE BEST ONLINE DOCTORATE IN SCHOOL COUNSELING PROGRAMS? What Else Can I Expect from an Online Doctorate in School Counseling Program? School counselors play an active roles in the lives of students. As a member of a school's administrative staff, counselors oversee a student's trajectory and nurture their professional and personal growth. An online doctorate in school counseling offers a flexible and comprehensive curriculum to prepare you for this rewarding career. And now is a great time to consider an advanced counseling degree: the Bureau of Labor Statistics projects an eight percent rise in employment for this field within the next decade. Many of the programs below are accredited by the Council for Accreditation of Counseling and Related Educational Programs (CACREP), which holds school counseling doctoral programs to the highest standards of counselor education and enrichment. These schools require applicants to have, at minimum, a master's degree in school counseling to gain admission. Doctorate degree programs are known for their scholarship and rigor, and students perform extensive research and field study. Coursework engages psychological theories from industry experts with an eye toward real-world applications, while students develop effective counseling techniques for use in various school settings. Students usually perform their own qualitative research and create a dissertation or final project to demonstrate their expertise, while finishing their program with an internship. Doctoral counseling programs typically require prospective students to possess a master's degree in psychology or social work and a valid professional license. Many admissions departments also require students to submit a resume detailing their previous work experience and letters of recommendation from previous employers. Research is key to finding the right online program, as each school has its own admissions requirements, prerequisites, and program requirements. Many schools offer options for completing coursework, such as hybrid programs or cohorts. Browse the websites below to learn detailed information about a school's doctoral program, and contact the enrollment counselor or academic advisor for more questions or information. CAN I WORK WHILE I COMPLETE MY ONLINE DOCTORATE IN SCHOOL COUNSELING? If you manage your time well, it is entirely possible to complete your doctorate degree online; in fact, most doctoral candidates are also working professionals. And some programs may require you to have a source of income before beginning coursework. Online doctorate in school counseling programs are intended to help working professionals complete a degree with minimal disruption to their busy lives. These will vary in length, so speak to an enrollment counselor to find out more details. At Oregon State, students in the Ph.D. in school counseling online program receive the skills and training they need to become advanced practitioners in the field. The CACREP-accredited program focuses on student contribution through research and addressing the changes occurring in modern communities. The program uses a "hybrid" online format. There are face-to-face courses, with sessions taking place at OSU's Wilsonville campus (in the Portland metro area) twice per quarter on Fridays and Saturdays. Students also work in cohorts with their peers, working together on key projects and research opportunities. Students must earn 150 credits to graduate, with the cost per credit set at $550. Courses cover supervision, advanced theory and practice, career counseling, consultation, and more. Oregon State’s main campus is located in Corvallis. Graduates are prepared for advanced clinical work, teaching, and more. However, this program does not lead to a professional teacher licensure. The doctor of education in professional counseling and supervision program at West Georgia prepares professionals for dynamic careers in counseling, enabling them to serve their communities in meaningful ways. The program builds on the skills and training students received through their previous undergraduate or graduate degrees, while expanding on their knowledge of program evaluation, advocacy, leadership, and clinical supervision. Students must defend a professional practice dissertation that focuses on how they will use their degrees to benefit the communities. To graduate from this online Ph.D. in school counseling program, students must earn 36 semester hours. Students work in cohorts of 12, with each program starting in the summer. Courses include quantitative research methods, supervision, program evaluation, and more. Students enroll in two-courses per term and are required to complete an on-campus orientation during their first summer of enrollment. Full-time students can finish the program within two-years. The main-campus is located in Carrollton, Georgia. An online doctorate in school counseling is a terminal degree program that prepares students for careers as clinical counselors. Graduates work at schools, research facilities, clinics, and in administrative roles. Most of these programs are accredited under the Council for Accreditation of Counseling and Related Educational Programs (CACREP), however course offerings and program requirements vary by school. Online doctorate in school counseling programs are created by the school's administrative board. Course listings differ by school but a sample curriculum is provided below. Clinical Supervision: This course prepares graduates for administrative work. Students learn methodologies and procedures to guide the administrative department of a counseling program, which may include monitoring other counselors and implementing department changes. Assignments focus on self-reflection and group discussions. Professional Orientation, Ethics, and Identity: An analysis of the American Counseling Association Code of Ethics, students develop their own identity as a counselor and educator. Learners explore the cultural perspectives of different counselors and how they co-exist with each other. The course focuses on the legal and ethical aspects of maintaining a counseling program. Teaching in Counselor Education: Covering the basics of counselor education, students develop techniques and methodologies for teaching adult learners. Students assess their personal experiences with teachers and apply positive techniques to their own pedagogies. They also explore the cultural dynamics of adult students. HOW LONG DOES IT TAKE TO GET AN ONLINE DOCTORATE IN SCHOOL COUNSELING? Online doctorate in school counseling programs vary in length based on the requirements of the institution. The best online doctorates follow CACREP-academic guidelines and complete coursework, residences, fieldwork, and a dissertation. Programs range from 60-80 credits and can take roughly five years to complete. Students often complete their online doctorate degree individually or in a cohort. Individually- paced programs are asynchronous, and students complete coursework when it best suits them and by a given deadline. Cohort programs use small working-groups to complete assignments together and are typically online at the same times. Cohort education is meant to provide social interaction and peer networking to online students. Both individually-paced and cohort programs offer access to an academic advisor for guidance. Regional accreditation is regulated by one of the six accreditation agencies in the United States. Credits from these schools are easier to transfer and most are recognized by other colleges and universities. National accreditation is primarily for vocational or technical programs, and includes many distance learning programs. Most nationally accredited programs accept credits from regionally accredited institution, however regional schools may not accept credits from nationally accredited programs. Some programs also hold program-specific accreditation. This is awarded by CACREP to specific departments within a college or university, and usually means they have strict academic guidelines and professional standards. The Department of Education oversees the U.S. educational system by distributing federal funding to schools. The Council for Higher Education Accreditation (CHEA) is an accrediting body with over 3,000 institution members that works with the U.S. Department of Education to identify accredited institutions. The Department of Education will only provide federal funding to students that attend accredited institutions, and schools must carry accreditation before they can receive federal funds. To find the best online doctorate in school counseling, visit the CHEA website. The best online doctorate in school counseling programs prepare students for careers in the public and private sector. Students learn what it takes to operate a counseling program and teach future counselors, and go on to work at local high schools, elementary schools, middle schools, colleges and universities. They also work for school districts or the local school board. Below are some of the many careers options a doctorate in school counseling may provide you. These counselors assist people with personal and family issues and develop coping strategies. Mental health workers also double as family and marriage counselors. They arrange counseling sessions to listen to their clients and assess the situation, and can hold individual or group counseling sessions. Most mental health counselors have a master's degree and a practicing license. Psychologists study the behavioral patterns of people living in different environments. They analyze data and speak to clients, while often working alongside social workers and physicians as members of the healthcare team. Employees in counselor education and supervision can work as practicing counselors or administrators. Salary is based on education level, licensure, and professional experience, and employees have the opportunity to increase their earning potential by receiving advanced degrees and certification. Below is a list of career opportunities for students in this field. The best online doctorate in school counseling programs prepare students to join the education administration workforce. Professional organizations mold and shape future leaders by offering vast networking opportunities, and access to materials that strengthen their knowledge as a counseling provider and educator. Members attend annual conferences and receive information about new job opportunities. This organization supports the development of American school counselors. They offer liability insurance and other resources. With over three million members from different areas of public education, this organization fosters growth of the national public education system and its students. This is the foremost organization for counselors in education and other disciplines, providing professional and educational resources to counselors throughout the industry. The majority of online doctorate in school counseling students take out loans to fund their education. Learners may go through a private lender to receive funds or they may defer to the federal government for assistance. All students should complete the Free Application for Federal Student Aid (FAFSA), which allows the government to identify the kind of funding you may benefit from the most.